Maxi Taurine Magnesium™ Complex is new heart and calming formula by Maxi Health Research®. We have combined Taurine (a trace amino acid), Inositol, Vitamin B6, and Magnesium for a holistic approach. Taurine is a key to nervous system regulation and helps support a healthy cardiovascular system. Magnesium plays a key role in moving toxins out of the cells and is required for muscle relaxation. Your heart is the one muscle in the body that never rests! Vitamin B6 is the master vitamin in the processing of amino acids, the building blocks of all proteins and some hormones. It facilitates the metabolism of homocysteine, to support a healthy cardiovascular system. Inositol is a super antioxidant. It also works with serotonin, a neurotransmitter! To support the holistic heart-mind connection. 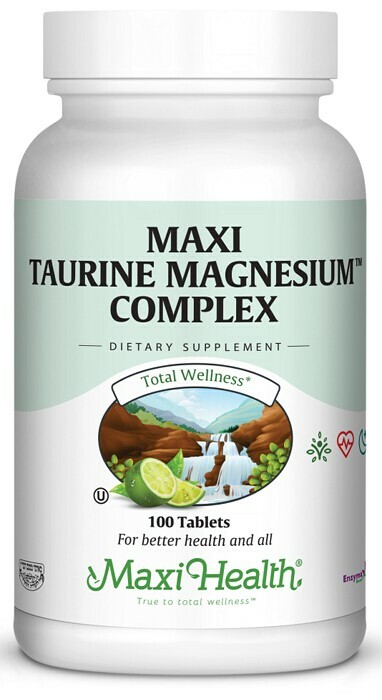 try Maxi Taurine Magnesium™ Complex! Take one (1) tablet twice daily or as directed. Other Ingredients: Dicalcium phosphate, microcrystalline cellulose, vegetable stearine, Enzymax® (calcium carbonate, bromelain, papain, lipase, amylase, protease, silica), croscarmellose sodium, silicon dioxide, and aqueous film coating (purified water, hydroxypropyl methylcellulose, vegetable glycerin). This product contains no animal products, soy, wheat, gluten, sugar, salt, milk, yeast, artificial flavors, colorings or preservatives.